Why Climate Change is Only a Side Show: the Sixth Extinction is Upon Us! In the United States, Climate Change is viewed with suspicion: many Americans don’t believe in it, at best they’ll agree that climate warming may have natural causes but they strongly refute the idea that it could be due to human action. And in any case, they reject any causal linkage with extinction of life on earth. Life has survived long periods of colder and warmer climate, they argue, and there’s no reason to believe that this time will be any different, regardless of who’s responsible for the warming – and supposing the warming actually occurs. For a strong statement expressing this viewpoint, see here, “global warming debunked” by Gary Ellis, who describes himself as an electrical engineer “with 40-plus years of work experience in electrical generation from methane gas to coal, natural gas and nuclear.” Incidentally, not a climate specialist but a person whose life has been invested in energy extraction. Right. You can always argue as he does that the science behind Climate Change is not strong enough or persuasive, that there’s a political agenda behind it. Whose agenda is never spelled out though the agenda of people debunking climate warming is pretty clear: they want to defend their kind of economy based on energy extraction that spews out tons of carbon in the air. Just ask the Chinese authorities and watch what they do to control the smog in Beijing. They’re the ones (along with India) who constantly defeat United Nations discussions on Climate Change and how to control it. But this discussion is sterile when confronted with the actual numbers out there: the numbers describe an alarming increase in the rate of extinction of species that often have been around for millions of years (like amphibians) and yet are headed for extinction – in some cases, right now. The rate in extinction is so massive that scientists have taken to calling it the Sixth Extinction – there were five before, notably the one that killed off the dinosaurs (that one was caused by an asteroid impacting the earth and causing the equivalent of a “nuclear winter”). But this one, the Sixth, is shaping up to be bigger than any other, the biggest ever, and it is caused by…yes, us, humans. Think of it. We’ve covered the earth, all 7 billions of us soon to become 8, 9, 10 billions – there seems to be no end to the population explosion. We use up every available natural resource, we cover the earth with our buildings, we shape the landscape, we travel everywhere, bringing seeds and species along in our baggage, thoughtlessly putting local biodiversity at risk. Big changes are in the offing: the disappearance of amphibians caused by the spread of a fungus, the fast acidification of the oceans that threaten the survival of reefs and all life in them, the extinction of bats in the United States – even our outdoor cats can be a cause of extinction as they relentlessly kill birds. I read about the cats (some 80 million of them in the US) yesterday in the International New York Times (see here: “That Cuddly Kitty is Deadlier Than You Think”): yes, a recent study has shown that sweet cats, some of the best companions we have, are among the most feral predators and given the facts of rapidly rising urbanization and modern agriculture reducing forest space, birds have few places left to breed and live. Add cats to the mix, and there you go: a silent spring! 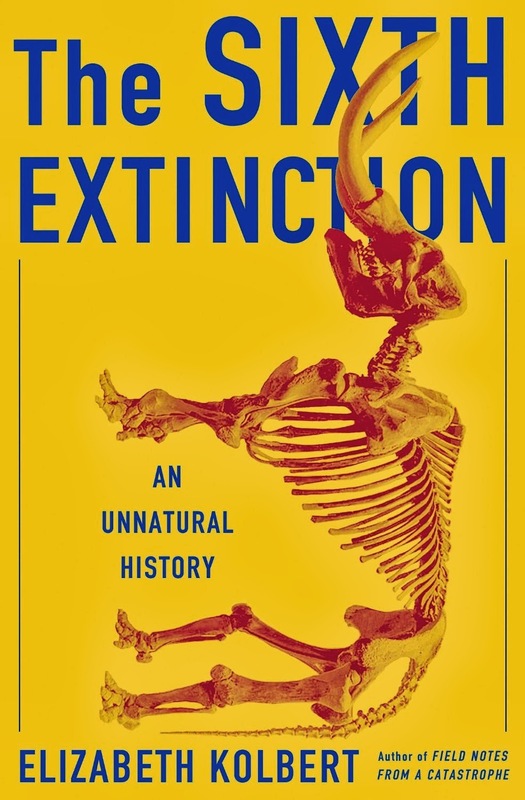 This is a horror story and it is excellently described by New Yorker journalist Elizabeth Kolbert in her book The Sixth Extinction, an Unnnatural History – now a #1 bestseller on Amazon in biology and a must read for anyone remotely interested in what the future holds for us. She expertly takes us along for the ride as she herself travels around and interviews scientists, often following them in their investigations. All this makes for a very human and effective read, in my view, Pulizer Prize stuff! What I like best about it, is that she cleverly avoids the confrontation with Climate Change: it is obvious that it enters the equation, it is a fallout of our activities but if you believe it is not, in fact, it doesn’t matter. It doesn’t change the thrust of the arguments about the Sixth Extinction or the results of observation. The data showing the on-going extinction is not anybody’s invention, it is solid science and cannot be debated or refuted like climate warming. As Kolbert says, even if you find a totally clean energy (say fusion), what would matter is whether you continue to cut down the rain forest. Some of those biologists interviewed by Kolbert have no doubts: human life is headed for extinction and what will follow are…giant rats! The rate of the current extinction? Scientists believe that up to 50 percent of existing species will have disappeared by the end of the century. Fast! And inevitable, it is already on-going. Nothing in our political set-up (especially at the United Nations where everyone is allowed to speak, including those who don’t understand the issues: see the failure in Copenhagen, here) permits us to think that we can escape the ultimate outcome. We might have the science to do it but we won’t do it for political reasons. Next Post Author Bob Rector’s Interview of C.N.